Need To Use All Those Cucumbers? What? A Dill Pickle Recipe on a restaurant recipe site? We received "tons" of locally grown organic cucumbers from generous guests. Too many to serve with salads. We did not want them to go to waste ... so we developed our recipe to can the pickles. Want to know one way to use all those cucumbers you have on hand? 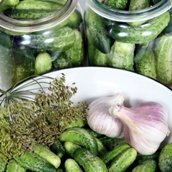 This easy Pickle Recipe will provide you with 8 jars of delicious dill pickles. I don't often can at the restaurant because of time constraints. But I do can a variety of fruits and vegetables for use at home. Summer and Fall bring an abundance of fresh fruit and vegetables to the table. Cucumbers are always plentiful in the area I live and so I have found ways to make use of them by making Dill pickles. Enjoy your dill pickle recipe and the company of those you share it with!